This makes accessing the RPC console very fast/easy. It also improves accessibility. Concept ACK - letters could be more mnemonic and stable over time because they aren't tied to the order of the list. @Empact could be, open for suggestions. Just used 1 to 4 because those are the tab indexes in the dialog. Sure, I could go either way. No strong opinion about numbers versus something not tied to an order. would it make sense to make these shortcuts application-global ? (see #15768 (comment)). I personally kind of expected pressing multiple in sequence e.g. Ctrl-1 Ctrl-2 to work. @laanwj currently it does, at least on macos. Have you tested in other OS? 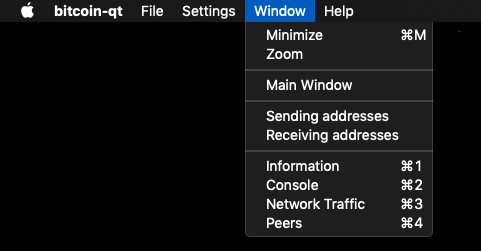 BTW, one could argue that these shortcuts are better fit for Overview, Send, Receive and Transactions tabs in the main window. Alt-1..4 already work for the main window tabs. I'm not sure using numbers for a different window makes sense. @luke-jr I wasn't aware of that. On macos shortcuts are usually with CMD (Qt::CTRL). So do you suggest using letters?